Lose fat without diet and exercise? Reduce the number of fat cells in targeted parts of your body? Sculpt a better looking you? How can this be? Is it too good to be true? Or is it just really cool – as in CoolSculpting. The CoolSculpting procedure eliminates stubborn fat safely and effectively, without surgery or recovery time. This fat reduction treatment is the only FDA-cleared procedure to use controlled cooling to safely target and eliminate diet- and exercise-resistant fat. CoolSculpting results are proven, noticeable, and lasting. Freeze away fat? It comes down to science. Fat cells freeze at higher temperatures than surrounding tissues. 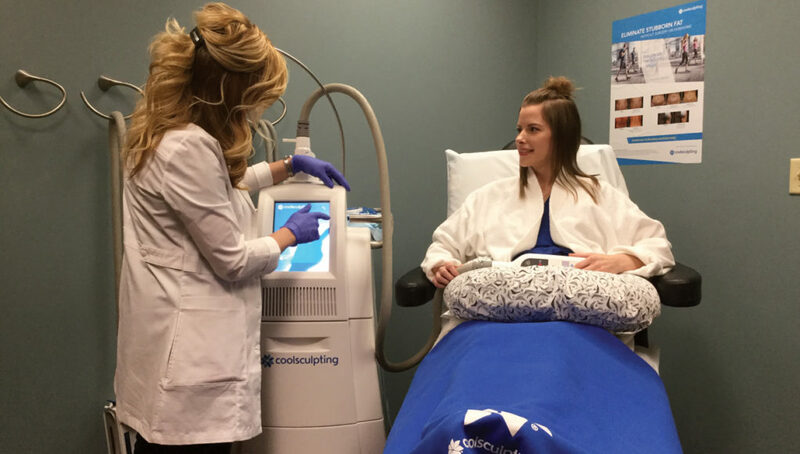 CoolSculpting technology safely delivers precisely controlled cooling (Cryolipolysis) to gently and effectively target the fat cells underneath the skin. The treated fat cells are crystallized (frozen), and then die. Over time, one’s body naturally processes the fat and eliminates the dead cells, leaving a more sculpted body. Many of us have stubborn fat despite diet and exercise. CoolSculpting technology targets and kills only these fat cells. You can reshape your body! Medical Associates can develop a customized CoolSculpting treatment plan that addresses your problem areas. Additional sessions may further enhance your results. Your individualized treatment plan will be tailored to your body, your goals, and your budget. All you have to do is sit back, relax, and say goodbye to stubborn fat. After the area(s) to be treated are selected, the device is positioned on your body and controlled cooling is applied. During your procedure, you may choose to read, check email, or even take a nap. You will like what you see. In the weeks and months following your procedure, your body naturally processes the fat and eliminates the dead cells. Listed below are answers to many often asked questions about CoolSculpting. An ideal candidate for Coolsculpting would be a man or woman that is close to their ideal body weight, but have areas of unwanted fat that are resistant to diet and exercise. It works well for people who would like to slim their body contours, look better in their clothing, feel more confident about their body shape, and would rather avoid liposuction or surgery. The Coolsculpting treatment procedure is not for obesity. As with any medical procedure, ask your physician if the Coolsculpting treatment is right for you. Medical Associates offers a free, no-obligation consultation with one of their Certified Coolsculpting Specialists to see if you are a good candidate for the Coolsculpting procedure. How much does it cost? Is Coolsculpting covered by Medical insurance? The price for Coolsculpting can vary depending on how many areas are being treated and how many sessions are needed to achieve the desired goal. Many patients treat multiple areas of the body to obtain optimal results. The cost typically ranges from $2000-$4000, depending on the number of areas treated. Unfortunately, Coolsculpting is an elective, aesthetic procedure, which is not covered by most insurance companies. Medical Associates accepts most forms of payment as well as promotional financing through Care Credit. You can apply online before or after your consultation to see what special financing they can offer you at www.CareCredit.com. How long is each session? How many sessions are needed? The length of your session can vary, depending on the number of areas being treated. Most Coolsculpting treatment cycles can be completed in as little as 35-45 minutes; however, most patients schedule multiple treatments during the same office visit. Patients can see results after one session, but some treatment plans require additional sessions to achieve optimal results. Each treatment is designed to achieve a 20-25% reduction to the targeted area. Adding additional sessions, increases the amount of reduction, therefore obtaining more dramatic results. Yes, once the targeted fat cells have been frozen, they undergo apoptosis, otherwise known as cell death. Your body then begins to process and eliminate these dead fat cells over the next several weeks. Coolsculpting results are long-term, as treated fat cells are gone for good. During the first few minutes of treatment, you may feel intense cold to the treatment site. This feeling soon dissipates as the area begins to go numb. You may also feel a pulling sensation, as a vacuum suction is applied with certain applicators. Many people read, watch videos, work on a laptop, and even take naps during their treatment. Medical Associates strives to make their patients feel relaxed and comfortable throughout their treatment time. Once the cycle is complete, you may feel a tingling or slight stinging to the treatment area as it’s being massaged for two to three minutes. Patients are able to return to normal activity following the procedure. The Coolsculpting procedure is proven to be safe and effective, as over six million treatments have been performed worldwide. In the U.S., Coolsculpting is FDA-cleared for treatment of the abdomen, flanks, thighs, upper arms, chin area, bra fat, back fat, and underneath the buttocks. Coolsculpting is also FDA-cleared to affect the appearance of lax tissue with the sub-mental (chin) area. Medical Associates is a Certified Coolsculpting Practice, and they have safely treated thousands of patients. Typical side effects after treatment include temporary redness, swelling, blanching, firmness, tingling, stinging, tenderness, cramping, aching, itching, or skin sensitivity. Sensation of fullness in the back of the throat after sub-mental (chin) treatment can occur. These effects are temporary and generally resolve within days or weeks following treatment. Although rare, some additional side effects may occur. Yes. Coolsculpting is a non-invasive, non-surgical procedure, which requires little or no recovery time. Most patients return to their normal activities immediately following their procedure. You may start to notice results in as little as three weeks after your treatment, and will experience the most dramatic results after two months. Your body will continue to flush out fat cells for up to four-six months after treatment. Do I need to take a special supplement or follow a strict diet and exercise program? No supplements or pills are required and you do not have to adopt new exercise habits. Most patients feel an increased motivation to follow a healthy diet and exercise routine and to maintain a healthy weight after their Coolsculpting treatment. Weight gain after Coolsculpting can prevent you from appreciating your full results. If weight gain does happen, it is evenly distributed all over the body, not just in the treated areas. Medical Associates offers a free, no obligation consultation and will create a customized treatment plan that is tailored to your body, your goals, and budget. Contact Medical Associates at (563) 584-3444 to find out if the CoolSculpting fat freezing procedure is right for you. Editor’s note: This article was compiled from Medical Associates’ website and information provided by Joy Musselman, Certified Coolsculpting Technician.